The plantar calcaneonavicular ligament (also known as the spring ligament) is a ligament on the underside of the foot that connects the calcaneus and the navicular bone. The plantar calcaneonavicular ligament is a broad and thick band of fibers, which connects the anterior margin of the sustentaculum tali of the calcaneus to the plantar surface of the navicular. This ligament not only serves to connect the calcaneus and navicular but supports the head of the talus, forming part of the articular cavity in which it is received. The dorsal surface of the ligament presents a fibrocartilaginous facet, lined by the synovial membrane, and upon this, a portion of the head of the talus rests. 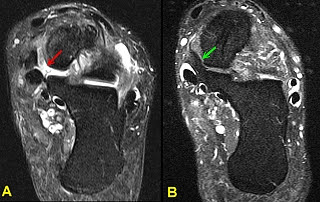 Its plantar surface is supported by the tendon of the posterior tibial tendon, its medial border is blended with the forepart of the deltoid ligament of the medial ankle. The plantar calcaneonavicular ligament helps to maintain the medial longitudinal arch of the foot and by providing support to the head of the talus bears the major portion of the body weight. 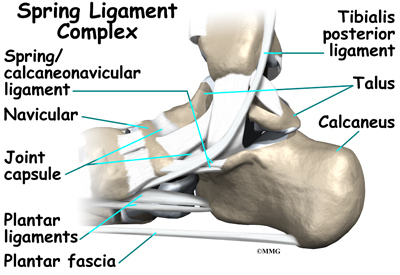 It is the main part of the spring ligament complex.